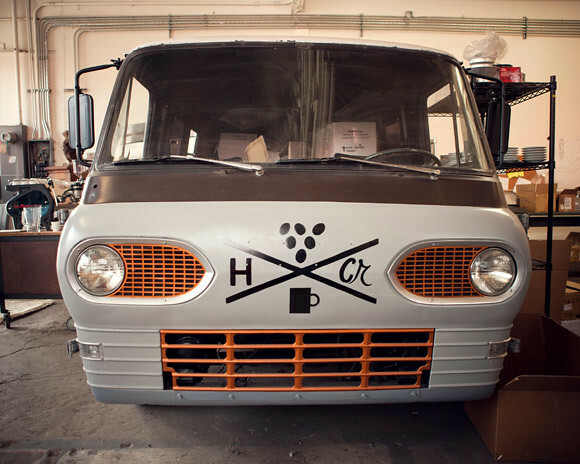 One of LA’s newest and brightest stars, Handsome Coffee Roasters, is about to hit the scene. No better place than our very own Downtown Los Angeles Arts District. Handsome Coffee is currently building out an old beau truss warehouse into a beautiful, modern, yet old timey roastery and cafe. A very welcome addition to the downtown arts district, a burgeoning area full of cool restaurants, pie shops, clothing brands, breweries, and artist ateliers. This is where the Poketo HQ is as well, we love it down here in the Arts District, it’s an exciting place and time for LA and we are stoked to be part of it. 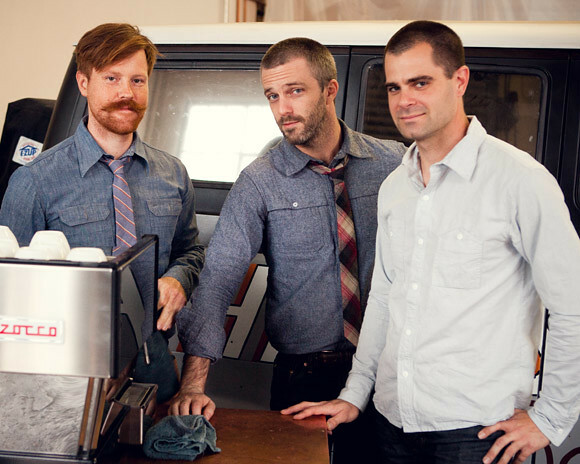 In fact, The Handsome Coffee crew will be at our annual holiday sale on December 10th with their espresso rig, serving up their finest. 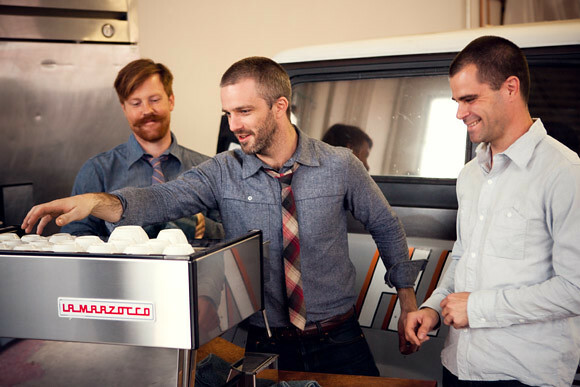 I stopped into to chat with Michael Phillips, one of the three proprietors of Handsome Coffee. I wanted to get a quick glimpse of the Handsome philosophy and what’s in store for all of us. I was lucky enough to have all three gentlemen there at the same time. It’s rare to have Michael, Tyler Wells, and Chris Owens in the same room together… Chris is often globe trotting sourcing the finest coffee beans, Tyler is always busy managing the buildout of their new HQ, and Michael is back and forth training the finest baristas… Michael is in fact a world barista champion himself. Why did you decide to establish Handsome in the Arts District? What is it that excites you about the area? The arts district was a natural fit for Handsome. It is filled with people who are interested in quality goods, open minded and often crafts people themselves of some sort. Getting to meet the people involved in making the arts district what it is already has been the most exciting part. It somehow keeps getting better and better every day. Tell us about the Handsome Philosophy. What makes a good cup of coffee for you? 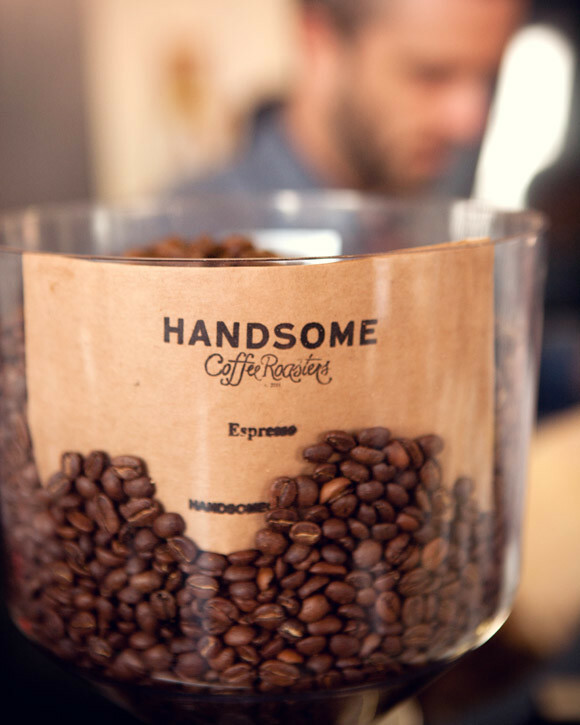 What would you suggest for a new fan of Handsome Coffee? Do very few things but do them all amazingly well. That’s our motto in a nut shell and you can see it in everything we do from our drink menu to our list of coffees. My favorite thing to drink is probably a nice, simple tasty cup of brewed coffee. It is something that invites lingering and conversation more than the intensely wonderful small espresso drinks that begs to be drank right away. 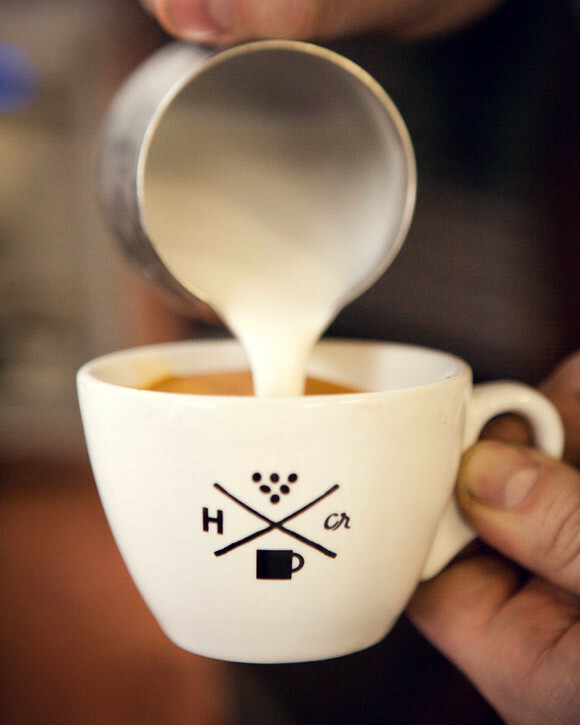 For new fans of Handsome I would suggest our espresso and milk 6 oz option. Doing brewed coffee at home is simple, espresso drinks can be pretty difficult so leave all the hassle to us. Nothing gives us greater pleasure than doing the heavy lifting on those drinks to make people happy. Consider us a hospitality company first and coffee company second. Michael, you are a Barista Champion. Tell us a little bit about the competition, what happens, what is it like? 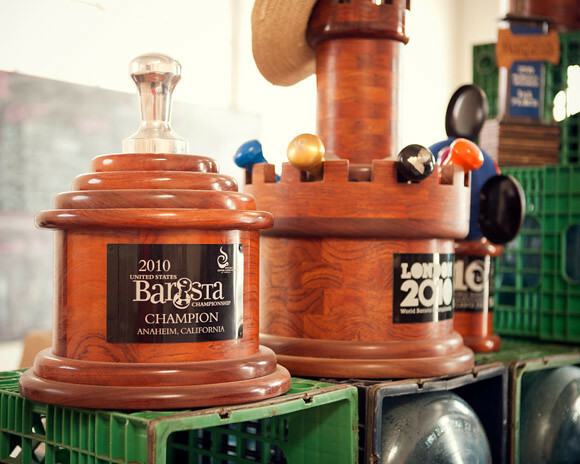 The competition is one of the few opportunities that exist to find recognition in the field of specialty coffee. 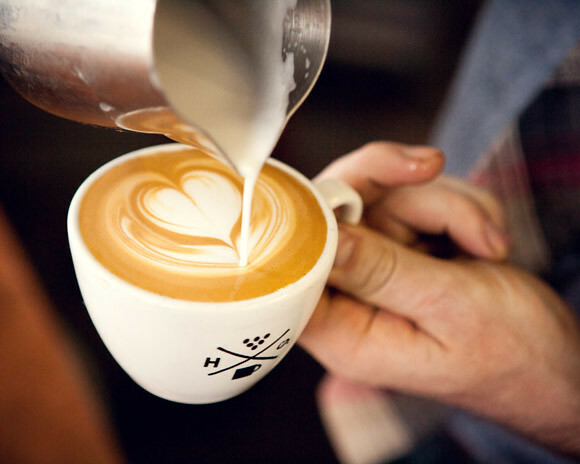 It involves creating a series a drinks from coffees that the barista selected and serving them to a panel of peers. The barista is evaluated on everything from their technique to the taste and appearance of drinks to how knowledgeable and professional they are. It is a bit of a high pressure, timed experience that for some reason suited me well. I would not label myself as any sort of extreme patriot, but the act of participating on the world stage and representing the US was kind of a great feeling. The core Handsome team is you, Tyler, and Chris. How did you meet? Do each of you guys specialize in one are of the business? I met Tyler as we were both preparing for competition in 2010 and Chris, as he was judging for the competition in 2008 (he actually judged and gave me my lowest scores!) We all have our niches but at the same time can cover any base we need to should we need to. Chris is the lead Roaster and coffee buyer, Tyler is the CEO so you better do what he says, and me? I primarily wash dishes and pick up after the other guys. 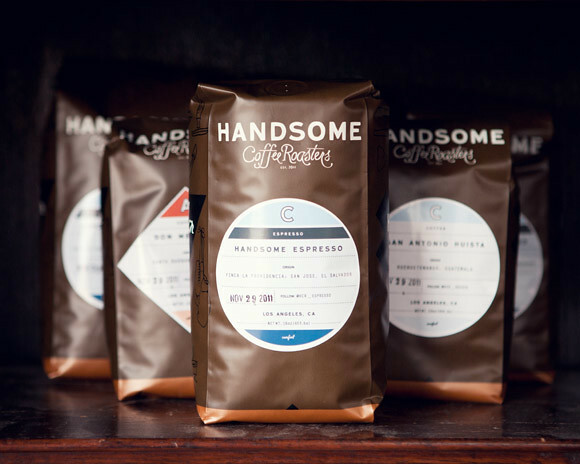 Give us a glimpse of what the Handsome Coffee HQ will look like and be. I know you have big plans in years to come, want to share any? Handsome Coffee Roasters HQ (HHQ for short) will be a very comfortable space that is being lovingly crafted by some very talented people at Woodsmithe, Nathanael Balon in particular. Think copper, wood, iron, a ton of natural light and the ability to see the entire roasting process from start to finish while drinking the product of it’s ambition. Where the future takes us is anyone’s guess, and personally I hope no one spills the beans to me about it because I really enjoy surprises. We are excited to have you and the Handsome Coffee team at our holiday event, we love your brand, your coffee, and you guys are awesome! Tell us what you are looking forward to at the event. I think this will be a great chance to meet our neighbors. We have loved everyone so far and know that we are just only scratching the surface. Even just getting to hang with the Poketo team on a nice December morning sharing coffee and stories alone would be a good time, it is a party from the word go.